It’s been a running joke since nearly the beginning of this blog that I’d writing about what I had for lunch for the majority of my posts, given that I wouldn’t have much else to write about. While over the last eight years that hasn’t been entirely true, there have been plenty of food-related posts. Now you can truly see what I’m having for lunch on most weekdays by clicking here. That is the online daily menu for the EA cafeteria. Since nearly all my lunches come from the cafeteria, I’m almost guaranteed to be eating one of those menu items on a daily basis. You can make a game of it! Try guessing which item I’ll choose today? Will it be the beef tacos or the pad thai? Though I think I know the answer, I was wondering tonight how many of my readers would remember a very obscure detail of this blog. I’ve written well over 2300 posts in the eight years this blog has been in existence (in all its forms). I have been the author for every single one of those posts, except for just one. Does anyone remember who my single guest author was? What did he or she write about? The winner should probably get a prize. Oh, and the guest author is not eligible to answer and cannot inform others to the answer. I’m guessing that no one will remember. In a post that I made over two years ago, I mentioned how I was thinking about getting a new cell phone. I never did go through with it and that means I’m still using the same cell phone. The particular model I have is now seven years old. In terms of cell phone technology, that’s a long, long time ago. About six months ago, I decided to see if I could continue to use this model until it was ten years old. Why? I’m not really sure, just to see if I could do it. That would take us into 2013. That’s still three years away. I recently upgraded my cell phone plan though. Though I pay less now, I get more features with my plan. That got me thinking that I’m not using the services that are available to me. Then I realized that cell phones now have built-in things like GPS and wifi. That’s pretty cool. Does anyone have any suggestions for a smartphone? Keep in mind, I am not going to buy an iPhone. Those things cost close to $1000 unlocked and there’s no way I’m gonna buy a phone for that much money. I’m leaning towards an Android phone. Anyone got one of those? Do you like it? Working for EA, I suppose the majority of game-related posts I write here are biased towards titles that EA develops or distributes. Case in point, the last post featuring the giveaway of the game I last shipped. In the interest of fairness and objectivity, let’s explore a new offering from Ubisoft, one of EA’s competitors in the marketplace. In the video above, you can see a demo of something called Your Shape: Fitness Evolved. It’s being marketed more like a fitness product than a video game. Your Shape utilizes the new Microsoft Kinect motion controller. It is a direct competitor to EA’s EA Sports Active 2, which also uses Kinect. UPDATE: Both Jamil and Amar answered correctly. Through a random draw, Jamil’s name came up. So congratulations to Jamil on winning his copy of skate 3! I’ll be in touch with Amar for a consolation prize. As he appears to be from Lithuania, I’m not sure my NTSC copy of skate 3 would have even worked on his European Xbox 360. This concludes another fantastic free giveaway on et.com!!! 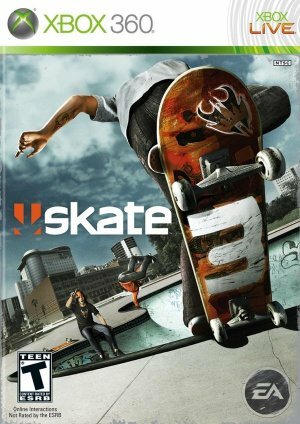 I have an unopened, brand new, shiny copy of skate 3 for the Xbox 360 to give away to one of my loyal readers. To enter this give-away, you just have to answer one simple question. The original skate was set in the fictional city of San Vanelona. What three real-life cities was San Van based on? Post your answers as a comment to this post. The winner will be drawn at random or by using an algorithm of my choice. Posted on June 24, 2010 June 25, 2010 4 Comments on SKATE 3 GIVEAWAY!!! Back in 2004, the mainstream news media reported that some Hollywood star had died. Major news outlets started reporting it as fact and at first no one really questioned who or where the story originated. After the initial rush to report the “death”, some of the media started looking for the source of the story. It turned out that the source was actually some press release that was found on the Internet. It wasn’t even a trusted site like Associated Press. The site was called PRWeb and people started figuring out that anyone could write a press release on that site and then have it sent out for free. PRWeb didn’t do any fact-checking at all so people could write whatever they wanted. In this case, someone wrote that an actor had died when he was actually quite alive and rich. Just to see if I could write my own press release and get it on their site, I whipped up the following awesome piece of writing. That press release is now six years old. Some of you who’ve been reading this blog for years will recognize it as I linked to it the day I wrote it. Yes, I’m re-hashing old material. Like most of you, I sometimes use the bathroom during the day. On most days, you’ll find me at work. Depending on my mood and where I am, I’ll sometimes use different bathrooms. There’s a particular bathroom by the cafeteria that’s quite interesting. This bathroom has a row of urinals and at either end of the row is a stall. The stall on the right is very small, meaning the space between and toilet the stall walls is tiny. Now sometimes when I walk into the bathroom, I’ll see the bottom of some dude’s legs in the tiny stall, doing his business. This in itself isn’t interesting, after all, with the exception of women, we all poop. The interesting bit is that the stall is really close to the urinal next to it. Because the stall is so tiny, the distance between the urinal and the toilet is probably three feet at best, most likely less than that. When you’re standing at that urinal and a dude is in the stall, it’s like you’re literally peeing next to a guy taking a dump. Now here’s where it gets weird. Some dudes have their ID badges worn on their belt loops because they use badge reels. Our ID badges have our picture on it and our names. Now the same dudes who have their ID badges on their belts, sometimes pull their pants down to their ankles when they do their business in that tiny stall. Now stay with me here. That means that their picture and name are visible through the opening between the bottom of the stall wall and the bathroom floor. As you’re walking up to the far right urinal, you can sometimes get a clear look at the picture and name of the dude doing number two right next to you. I guarantee you won’t read another blog post today about the same subject matter. One of the most personal details about an individual is how much money they make. Unless you’re a blabber-mouth, chances are people keep their salaries very private. If you’re a highly-paid public sector employee in British Columbia though, no amount of tight-lipped silence will keep your salary secret. The Vancouver Sun, the Vancouver’s largest newspaper, has compiled a database of nearly all public sector employees who make more than $75,000. The database lists employee names, titles, change in salary from last year, and expenses (if applicable). It’s a goldmine of info about anyone who works for a public office. The database includes sectors like provincial government, local government, Crown corporations, school districts, and post-secondary institutions. I used the database to look up the salaries for nearly every single one of the professors who I knew while I was in grad school at UBC. I even looked up a few of my undergrad profs. Were there any surprises? Not really, each of them, without exception were making six figures. The only question was how much more beyond that magic mark were they making. Next I looked up the highest paid people in my local municipal government. There were a lot of “managers” in that list. I wonder how many of those people are unionized and how much work they really do in a typical day. Then I tried looking up people I knew who I thought might be public sector employees. Some people were federal government employees so that didn’t work. I managed to find one dude who I went to school with. It turns out he makes a really good salary, very close to six figures. I won’t disclose his identity but I’m sure going to try to get him to buy me dinner the next time we meet up. Posted on June 21, 2010 4 Comments on HOW MUCH DO THEY MAKE? You almost didn’t have the chance to read this. I forgot that my web hosting and e-mail accounts were going to expire tomorrow. I just renewed them about five minutes ago. Here’s to another year of reading what I had for lunch! The video you see above is from a yet-to-be released game called Dance Central. The game is made by Harmonix, the fine folks behind the Rock Band series of games. It utilizes the Kinect motion sensor for the Xbox 360. It is essentially what Rock Band did for musical instruments, except the concept this time around is dancing. I think I’d have to extremely intoxicated to play this game in front of people. I think I’d wind up looking like this guy (who is actually playing the game).